It’s amazing to think that my relationship with the ILETC began well over two years ago with a simple email in June 2015 explaining my hopes of obtaining a Fulbright scholarship and working with the team. After planning my proposal and iterating on my application, I finally learned in March 2016 that I would indeed be spending 2017 in Melbourne! As that year now comes to an end I can say with confidence that it has surpassed my expectations and was worth the lengthy lead-time. My personal experience working as an Educational Space Planner back in States is what fuelled my desire to become a part of the ILETC team. It is common for primary and secondary schools to embark on a building project with the expectation that a change in space will naturally result in a change in pedagogy. However, this expectation too often falls flat and what results instead are schools that may have all the attributes of a 21st century learning environment but in reality house single-cell, industrial pedagogy. My goal for my Fulbright year was to explore how to better manage this transition and identify the key characteristics designers, educators, and school leaders can utilize to turn their initial vision of student-centered, multi-modal, and engaging learning into reality. 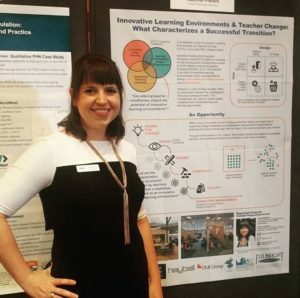 Raechel presented her research in several forums during the year, including a Fulbright event in Canberra. To meet this goal, the ILETC brought me into its PhD cohort, aligning my Fulbright research with Phase 1 of the project. Through this, I completed case studies at four schools in Australia and New Zealand, working with teachers, school leaders, and school designers to unpack each school’s process and elements of the transition. I am currently in the process of analyzing the data to be submitted for publication but here’s a sneak peak! One trend constant in all case studies was the importance of structure. Structure comes in many forms and across multiple layers of the school organization but represents the tactical level of the initial vision underlying the design of the learning space. Identified by one school leader as “restocking the toolkit”, these structures are needed in the face of a reality in which educators will seek the familiar. When a classroom is taken away, the purpose and potential of the open learning space that may have replaced it should be communicated with clarity and agreed standards of use identified. When students no longer have to sit at a desk in a chair, facing the teaching wall, we should provide them a new set of behavioral expectations. It all comes down to the proper induction of teachers and students to create the new normal in the learning experience. As designers, we need to recognize that change is scary and hard. It is on us to work with our clients to resolve the perceived barriers that come along with these innovative learning environments so that the benefits of the spaces can be reaped. We should engage in conversation around the issues, bring them out early in the design process, and challenge the educators and school leaders to begin thinking of ways in which they can “restock their toolkit” to make the new spaces a success. One year is a quick timeline to start and end a research project and I was only able to dive into a small piece of what aids in successful transitions. However, I am pleased to announce that I am officially continuing my research as a PhD student on the ILETC team. This means that what started as a single project through my Fulbright scholarship will now serve as the pilot-study for my burgeoning PhD explorations. Creating this new normal is complicated and should be tailored to suit each specific school and community. I am confident that the ILETC project will reach its goal of crafting a usable repository of strategies and tools that will assist schools throughout Australia, New Zealand, and perhaps the world with their shifts in pedagogy and space and am so proud to be a part of this team. A huge thanks to Wes, Marian, and Joann for their constant guidance and for agreeing to host me this year. Also thanks to Richard Leonard at Hayball Architects and the PhD students for being so welcoming and supportive. Finally, I am grateful to the whole LEaRN team for welcoming me to the family for the year. May the adventure continue and may I never be too far from TimTams and good coffee!